Brighten the office with soft colored papers and bindings to match. Colors are easy on the eyes and help organize projects. 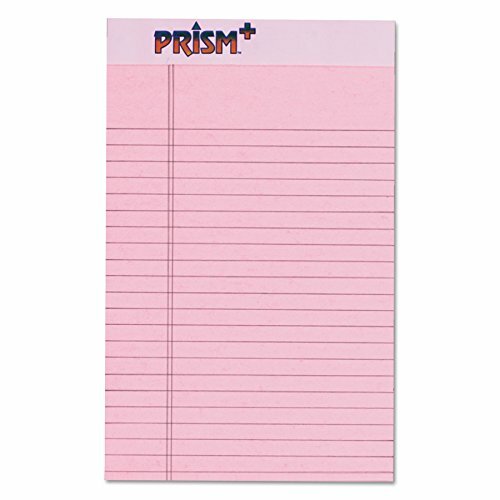 Prism Plus Pads also offer a rigid chipboard backer that acts like a clipboard, providing excellent writing stability. The paper is made from 100% recycled fiber with at least 30% post-consumer content. Easy-tear, Letr-Trim perforations allow sheets to be removed easily. Each pad contains 50 narrow ruled sheets of 16 lb. paper and is sold in a convenient 12-pad pack. Since 1952, TOPS has provided quality products and services to businesses throughout the world. TOPS continues that commitment providing innovative, high quality value-added paper products for the office, school and home. Whether it's a multi-part form, notebooks, writing pads, record books, or any of the hundreds of items we offer, you can count on TOPS products to help! View More In Letter & Legal Ruled Pads.